ITP show | JONAH BRUCKER-COHEN, PH.D. ITP show – JONAH BRUCKER-COHEN, PH.D. 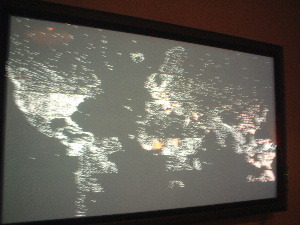 In NYC for a week – checked out the ITP Show which was a fun event with lots of interactive projects up. A really nice project by Patrick Dwyer (pic above) called “News Weather” – should be called “World View” – that scans news sources and increases the size of the dots representing the cities depending on how many mentions it finds online. The idea would be to look at the map at any given moment and have an idea of what events might be happening. The only problem with this project was that the dots lack context – so for instance if there is a large dot on “Washington” – it could be because Denzel Washington had a new movie out – not because Washington, DC was in the news… so that might be something good for the next version..